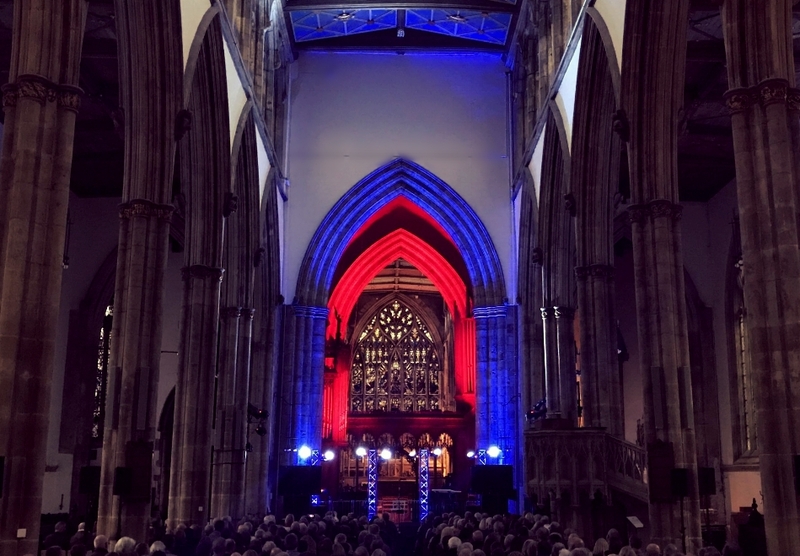 Hull Minster is an amazing place to be enjoyed by the whole community. For over 700 years we have stood in the heart of Hull’s Old Town as its civic church which welcomes all through our doors. Our magnificent medieval building has many interesting spaces which are used for a wide variety of activities and events from artistic and cultural performances, recitals and exhibitions, receptions and celebrations, banquets and festivals. We have hosted a wide range of events such as fashion shows, rock and pop concerts, classical and choral recitals and concerts, networking events and training courses, history talks, graduation ceremonies and youth parties. We have completed phase 1 and 2 of our £4.5m development project to improve our facilities and create a large, open space in the nave. The Nave has underfloor heating, Cat5e and 6 data points and 2 x 13a amp sockets at each pillar. A new audio and video system, including a 4 x 2.4 metre projection screen in the main east/west arch for use in the Nave. The AV is now capable of supporting a wide number of uses and configurations. The new lighting system allows for a theatrical element to be incorporated in to your event, or to support a wider, temporary lighting installation. We now have a fit for purpose building of historical and medieval importance combined with modern infrastructure for the next generation. A large and open space with the flexibility to accommodate almost any type of event; performance based, spoken word, markets, festivals, banquets, conferences. CAT 5e and CAT6 data points, for audio, video and data distribution, power supply on every pillar to enable events to be set up in any configuration in the space. The new lighting system allows for ambient lighting to be tailored to very specific needs. The new sound system is inclusive of radio mics and mixing desk and new audio visual equipment will be accessible. With a mixture of stunning Victorian pews and chairs, overlooked by our beautiful East window, the chancel is ideal for intimate musical and theatrical performances and talks. The sanctuary provides a natural stage setting The Chancel can be used independently of the Nave or as an extension area to the an event in the Nave. Similar space to the North Choir Aisle with the close proximity to the kitchen. A space suitable for small services, conferences and gatherings. The North Choir Aisle has an audio system in place and a portable projector and screen can be erected. Seating is provided by a selection of our re-purposed Victorian pews..
A purpose built Victorian rehearsal room with small kitchen off. Ideal for educational and choral workshops (practicing and changing,) and as a meeting room. Located on the West side of Trinity Square, the Parish Centre is used as a conference facility, rehearsal space, educational workshop area, a meeting room and a multipurpose space for small, organised activities. It includes a fully functioning kitchen, audio visual equipment and chairs and tables.